We offer a complete range of structured wiring solutions to enhance the functionality and efficiency of your home. Our structured wiring systems provide for complete audio, video and data transmission throughout your home. Your system will include sophisticated wiring protocols built into the walls and a residential gateway that serves as the central hub for your electronics. Our state-of-the-art data transmission structure allows for multiple phones lines, data streams, Internet access and audio / video signals to occur simultaneously throughout your house. 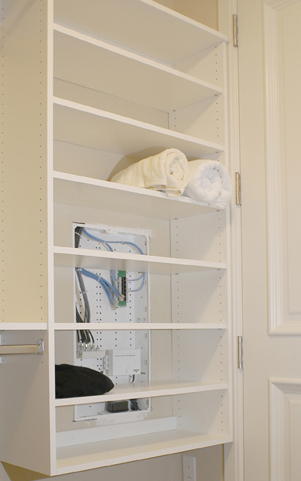 Our wire management system is cleanly hidden inside your walls and can be accessed by you through multi-port wall plates that are placed exactly where you need them. Our wire solutions allows for expansion when you are ready for it. Once your home is equipped, you will have the ability to enjoy whole house video and audio, computer networking, security, climate control, lighting and more. This solution will not only enhance your lifestyle, but it will increase the value of your home.